Do you suppose Bruce Wayne wears these? High-quality money clip, tie bar, and cufflinks based on Batman! Show your love for DC Comics with this high-quality Batman Logo Money Clip, Tie Bar, and Cufflinks Gift Set! It's the perfect way to subtly style your geekdom in a classy and reserved manner appropriate for any upscale event. 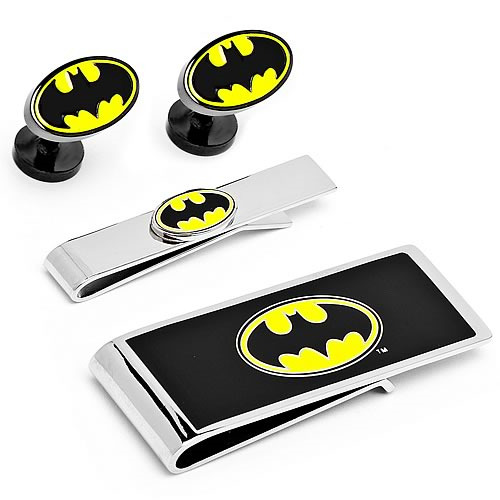 With these money clip, tie bar, and cuff links, you can show everyone how much you love Batman, and also sport formal-wear jewelry that features the Dark Knight's iconic black-and-yellow logo! Do you suppose Bruce Wayne wears these? Crafted with enamel and silver plating. The Cufflinks measure about 3/4-inch square, the Tie Bar approximately 2-inches long x 3/8-inch wide, and the Money Clip about 2 1/2-inches long.